Second, I’ve got a brand-new Storybundle to tell you about, and this one is a bit different because I co-curated it with Dean Wesley Smith. Storybundles are always fun to curate. Brainstorming them together makes it even more so. Especially when that other brain is Dean’s. He and I think very differently, which is a good thing. When we start collaborating—be that co-teaching or co-curating—our different approaches help us take each other’s ideas and build on them in such a way that, when we’re done, we have something greater than either of us might have conceived of on our own. I bring order to his chaos. He helps me tap into my creative brain and think outside the box. Our disparate ways of thinking are alien to each other and yet we have found a way not only to appreciate those differences but also allow them to expand our own perspectives. No wonder we came up with the Aliens Among Us bundle. Not surprisingly, Dean and I think about the topic of this bundle in different ways. For me, I focused on the “us.” How would we humans choose to react to aliens? Would we use our better natures or be driven by fear? Kristine Kathryn Rusch’s award-winning The End of the World perfectly illustrates this conundrum. And it’s why I chose that particular book for this bundle. “Science fiction readers all know that the main theme of all science fiction is the alien among us. Early on, when science fiction was a genre only read by science geeks and kids who built their own telescopes, readers felt that they were the aliens in the larger real world. As you can see, the term “alien” has a rich and varied meaning. And the Aliens Among Us bundle has a rich and varied group of books from some of the top science fiction writers working in modern fiction. It’s summer, and from what I hear from many of my friends outside the Oregon Coast, it has been a hot one. I remember hot summers. Probably the hottest was the summer I spent in Madrid, Spain, with my father, sister, and best friend. It was 1992, the summer of the World’s Fair in Sevilla and the Summer Olympics in Barcelona. We traveled a lot that summer, but my strongest memory is of passing out on the escalator in a metro station in Madrid. I’ve never handled extreme heat well, and it was 110 degrees that day. The metro wasn’t much cooler, even though it was underground, and it had no air conditioning. Needless to say, our plans for the day were derailed by my fainting. Although, thanks to one aggressive Spanish taxi driver, our adventures were far from over. But that’s another story. Now, when I talk to my good friend in Madrid, and he tells me of the heat, I remember that day. And I think the only good plan for a hot summer’s day is to stay inside the air conditioning and read. The SF&F Binge Reader Bundle, curated by our own Kristine Kathryn Rusch, offers a new (at least new to us) twist on the Storybundle concept. Storybundle, of course, bundles books together for a limited time and a great price. This bundle, however, bundles bundles. Yes, that’s what I said. Four book bundles for $5 or ten for $15. You can read all about this amazing bundle here. But don’t forget, this bundle is only available for another couple of weeks. We’ve got more books in more Storybundles launching over the next couple of weeks, as well, so stay tuned! I was discussing the nature of crime the other day with a colleague. I recently caught someone in a deception and was marveling at the stupidity of people who choose deception over honesty. We’ve all heard of the stupid criminal. It’s one reason why our jails are so full. They just don’t think things through far enough to cover their tracks. Lucky for the rest of us. Fortunately, most people are generally smart enough to realize that crime doesn’t pay. Even better, some of the most brilliant among us channel their energy into writing about the crimes they can imagine, and have fictional characters act them out. Like the amazing collection of authors in the latest Storybundle: The Dark Crimes Bundle, which is curated by New York Times bestselling author Kristine Kathryn Rusch. “I have only a handful of requirements of crime fiction—innovative characters, twisty plots, concrete settings, and great voice. Not many mystery writers manage to hit each requirement. I’ve read so much crime fiction that I’m hard to surprise. I get irritated when I can’t “see” the setting. I don’t want to hang out with the same kind of characters who show up on TV. And I really want to hear someone whisper in my ear as I’m reading. “Every writer in this bundle hits all my crime fiction requirements. In fact, every writer here exceeds them—always surprising me, always entertaining me. I love the work of each writer in this bundle. In one way or another, I’ve worked with each one of them. I’m not the only one who recognizes their quality either. We have New York Times bestsellers, Macavity winners, Shamus winners, Derringer winners, ITW Thriller Writer award winners, and international bestsellers. WMG has three books in this bundle: Spree by Kristine Kathryn Rusch, Kill Game by Dean Wesley Smith, and Fiction River Special Edition: Crime. Click here to read more about it. And while you’re there, be sure to check out another fantastic bundle, The Moonscapes Bundle, curated by Dean Wesley Smith. You can read more about that bundle here. But don’t forget: This is a limited time opportunity (Moonscapes ends this Wednesday!…Dark Crimes in a couple of weeks), so don’t let it pass you by. Because that would be a crime. I have a couple of fun surprises in store for you this week with two fantastic, yet totally different, types of bundles. And even better, one is nonfiction and one is fiction! First up is The Write Stuff 2017 Storybundle. 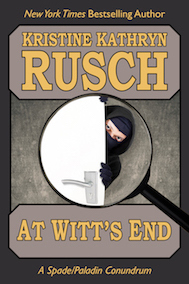 Curated by brilliant businesswoman and amazing author Kristine Kathryn Rusch, this bundle contains books by Kris, Dean Wesley Smith, Lawrence Block, Joanna Penn, Tonya D. Price, Maggie Lynch, Leah Cutter, Chuck Heintzelman and Mary Buckham, plus a free (yes, you read that right…free) WMG online lecture and steep discounts on Jutoh and Writer’s Café. And don’t forget, you name your own price with Storybundle. Writing a book should be as easy as reading one. Right? Right? Sounds so simple. But writing entertaining fiction isn’t simple. It’s like juggling while doing a one-handed handstand while balancing a box of three angry cats on your left foot. Enter The Write Stuff Bundle 2017. I put it together with writers of all levels in mind. Our charity for this bundle, AbleGamers, helps people with disabilities enjoy the imaginary worlds of video games. The organization provides one-on-one assistance to help people with a variety of disabilities join the lively interactive world of gaming, easing the social isolation that being disabled can bring. You can read even more about the bundle at https://storybundle.com/writing. But hurry: This bundle ends May 11. 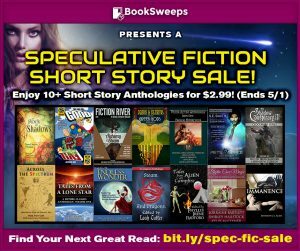 For the second surprise, I’ve teamed up with a whole bunch of speculative fiction authors to offer more than 10 great short story anthologies for $2.99! Fiction River: Alchemy & Steam and the first Uncollected Anthology volume are included in this promotion, along with and stories from authors like Patricia Burroughs, Marion Zimmer Bradley, Ursula K. Le Guin, Vonda N. McIntyre, and Pam McCutcheon. Check out all the books here: bit.ly/spec-fic-sale. But act fast: This one ends May 1. My first brush with time travel was A Wrinkle in Time by Madeleine L’Engle. Although I remember very little of the specifics of that story, lo these many years later, the book has nevertheless stuck with me. I might not remember the details, but I certainly remember the feeling of wonder and possibility the book instilled. Later in my formative years, two other time travel tales feature prominently in my memory, although in this case the medium was film. Somewhere in Time, starring Christopher Reeve and Jane Seymour, is one of my mother’s favorite movies. We watched it again and again in television reruns. In fact, Dean Wesley Smith’s Thunder Mountain series reminds me of that movie in some ways, especially The Edwards Mansion. And while Somewhere in Time might be less well known, the next one was a worldwide phenomenon. Back to the Future captivated me for a whole host of reasons, not the least of which was Michael J. Fox (teen heartthrob that he was). But the concept of the movie captivated me, as well. In fact, every time I saw a DeLorean (someone in my neighborhood actually drove one), I found myself looking thinking about time travel. Maybe it’s because I always felt a bit out of time. Regardless, these first experiences sparked a lifelong love of time travel fiction. How convenient that I now get paid to read it <g>. And if you love time travel fiction as much as I do, you’ll want to know about WMG’s latest collaboration with Kevin J. Anderson and StoryBundle. Kevin has put together great stories by bestselling and award-winning authors as well as some of the best new indie writers. If you’re unfamiliar with StoryBundle, go to their website to read all about it. It’s a really cool concept. This bundle is only available for three weeks, so don’t dally. Remember, you can’t actually time travel back in time if you miss it. That’s just fiction, after all.